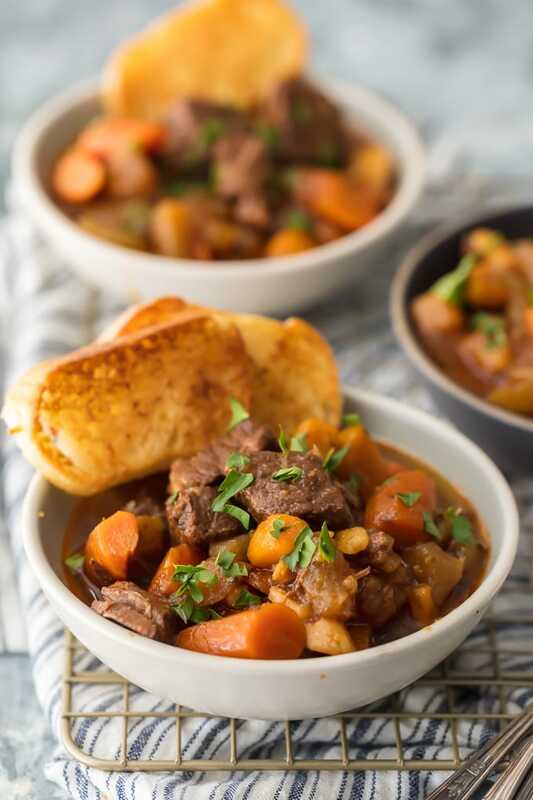 Instant Pot Beef Stew Recipe (5 Spice Beef Stew) is topping my list of favorite Winter soups this year. 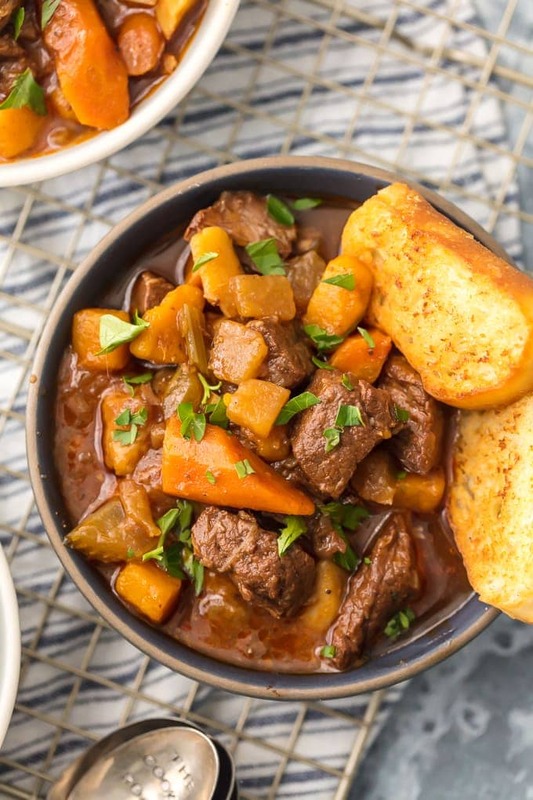 There’s just something about this Beef Stew; so comforting, easy, and unique! It’s made in minutes in the pressure cooker and sure to please the entire family. It’s loaded with carrots, parsnips, beef, spices, and more! So much flavor and so little effort. This Instant Pot Beef Stew is my kind of recipe. 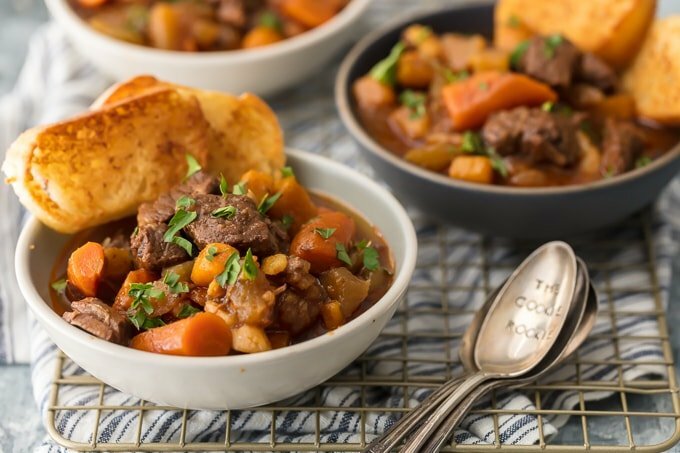 Beef Stew is the type of comfort food everyone needs on a chilly Winter night. I’m so excited about the Instant Pot Beef Stew with Five Spice. Raise your hand if you’re absolutely fall on your face OBSESSED with your Instant Pot! Every time I use it I pretty much swear its going to be the only kitchen tool I ever use again. I mean I know we have crazy technology left and right but I’m just honestly in awe of how fast the pressure cooker works. Of all the cool stuff in our world right now, I know its not that ground breaking…but it sure is cool. I mean we cooked a Thanksgiving Turkey breast in ONE HOUR!? Mind blowing. I have so many recipes that I want to learn how to cook in an instant pot, but this 5 Spice Beef Stew was high on my list. 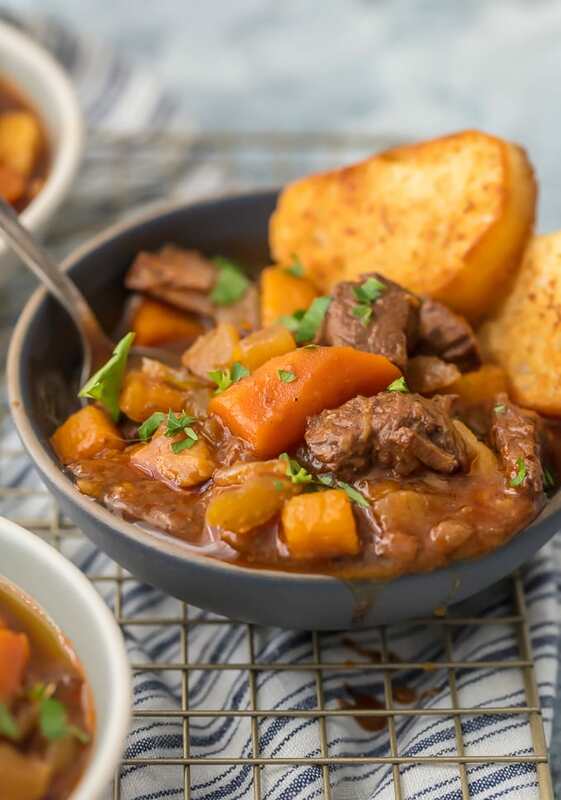 I love a comforting soup or stew for Winter, and this Instant Pot Beef Stew is top notch. Unique, flavorful, EASY, and oh so delicious. Cold weather has nothing on us when we are eating this for dinner! 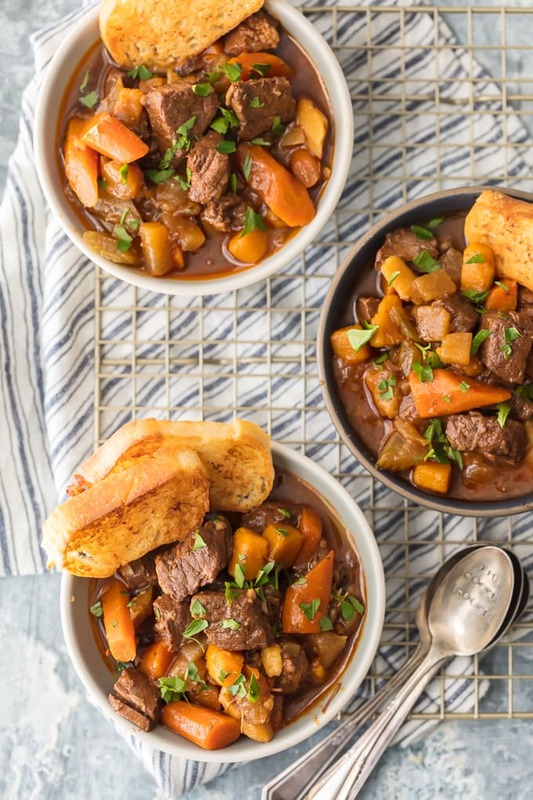 This Instant Pot Beef Stew is SO hearty and flavorful. I love the addition of 5 spice for a unique take on a classic Winter recipe. Regular Beef Stew (or Guiness Beef Stew if you’re a beer drinker) is awesome on its own, but I happen to just love this 5 Spice version. I lovvvve the flavor and I think it’s perfect in this stew. Adds just enough difference to really make it stand out. You can buy the blend in any grocery store spice aisle. What is 5 spice (or all spice)? Five Spice is a seasoning blend traditionally used in Chinese cooking. It typically includes star anise, sichuan pepper, black pepper, cloves, and cinnamon. You can make it on your own or buy it premade at any grocery store in the spice aisle. 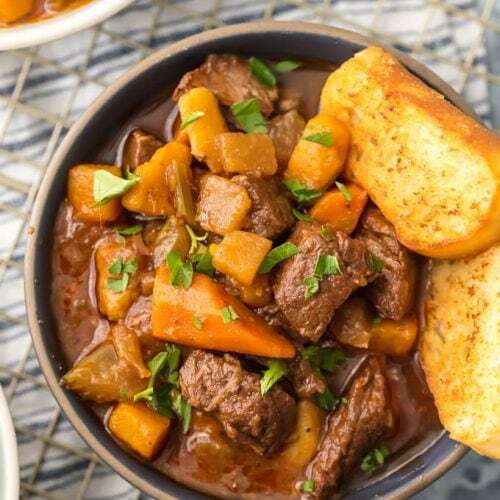 It’s absolutely DELICIOUS in this Instant Pot Beef Stew Recipe. You’re going to love it! We loaded this 5 Spice Beef Stew with tons of healthy veggies like carrots, potatoes, turnips, parsnips, and onion. If you like peas, you can throw those in as well. My dad HATES peas so if my Mom is helping in the kitchen, they’re usually the first to go. :) Pat hates onions but I could care less. He’s just flat out wrong when it comes to onions! Can you use chicken broth in a beef stew? You can! If you prefer chicken stock/broth or already have that in your pantry, feel free to use that. It won’t taste chicken-y…it will be just fine. Is the Instant Pot safe? Can it explode? The Instant Pot has 10 different safety mechanisms in place to make sure it doesn’t explode. It’s not anything like scary pressure cookers of the past. Most accidents are totally due to user error and can be easily avoided. Be sure to follow instructions but you’re in good hands. How can you thicken a beef stew? If you want your stew thicker, mix one tablespoon of cornstarch with one cup of stew liquid and stir until a paste forms. Add it in gradually to your Beef Stew, stirring as you combine. If you haven’t tried out an Instant Pot yet…what are you waiting for! OBSESSED! I have linked my favorite sizes and styles below in the shop this post section. If you’re looking for other IP recipes, be sure to check out our Pressure Cooker Honey Baked Ham, Classic Pot Roast, and Apple Pie Oatmeal (8 minutes to the best breakfast ever!). We have so many great Beef Recipes that I hope you stick around and try! Some notables are our Easy Stromboli, Stovetop Burgers, BEST Chili Recipe, and French Dip. MMMMMM! Beef, It’s what’s for dinner. See the recipe card below for full details on how to make Instant Pot Beef Stew. Enjoy! Instant Pot Beef Stew Recipe (5 Spice Beef Stew) is topping my list of favorite Winter soups this year. 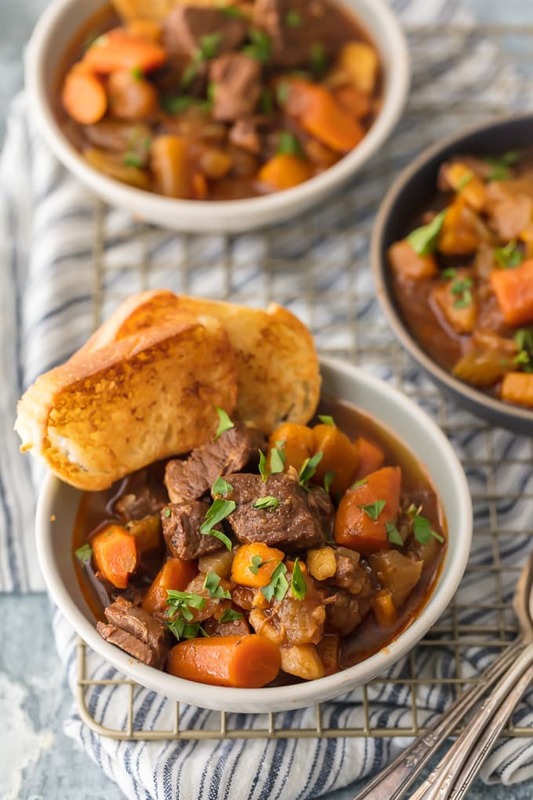 There's just something about this Beef Stew; so comforting, easy, and unique! It's made in minutes in the pressure cooker and sure to please the entire family. It's loaded with carrots, parsnips, beef, spices, and more! So much flavor and so little effort. This Instant Pot Beef Stew is my kind of recipe. Sprinkle the stew meat with salt, pepper and Five-spice seasoning. Set the Instant Pot to sauté. After 1 minute, add the olive oil and sesame oil. Place half of the stew meat in the pot and cook it until meat has seared on both sides. Transfer the meat to a plate and repeat with the remaining stew meat. Set aside. If needed, add 1 tablespoon olive oil to the Instant Pot. Add the onion and sauté until onion is translucent. Add the minced garlic and stir. Add the tomato paste, stir and cook for 1 minute. Pour in the beef broth and scrape the bottom of the pot to loosen the brown bits. Add Hoisin sauce and the seared beef. Mix well. Add celery, carrots, sweet potato, parsnip and turnips. Close the lid on the Instant Pot and be sure the steam valve is closed. Set the manual button to 25 minutes of high pressure and allow the pressure to release naturally. When pressure has released, remove the lid and taste the stew. Season, to taste, with salt and pepper. This is delicious served on a bed of white rice and with a side of roasted broccoli. *Note: If stew needs thickening, mix 2 tablespoons cornstarch with 2 tablespoons cold water and add it to the stew. Stir to thicken. AROUND THE WEB: Wanting to try different stew recipes? Here are some we love: Oyster Stew, Chicken Stew with Quinoa, and Slow Cooker Pork Stew. I love my pressure cooker! I bought it on a wim about 3 years ago and it amazes me every time I use it! I am a new follower to your blog and have been loving it! 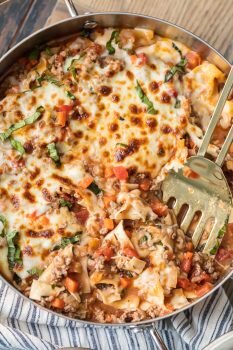 Absolutley love this recipe! Been building a list of pressure cooker recipes to use. You are not alone on the onion with the hubby! Onions ad so much flavor to recipes but I am forbidden from my Husband from cooking with them. Once in a while I sneak them in. HA! CERTAIN RECIPES REQUIRE THEM. THANK YOU SO MUCH FOR SHARING THIS RECIPE! HA! Yes, I totally sneak onions in. He never even knows! I’m with you on the pressure cooker, so cool. Thanks so much for stopping by, I hope you love the recipe! The recipe calls for the veggies to be diced, however the picture shows them chopped large. How big should the veggies really be? I don’t want them to be mushy or too firm. Thanks, looks good! I have never heard of the chinese 5 spice seasoning. I hate to buy something that I use in just one recipe. Is there a way to make this with spices on hand? Thanks! Totally understand that! Here’s a recipe for putting the spice together on your own. You can make them chopped rather than diced. It’s really whatever size you prefer in your soup. Sorry that was unclear! i am OBSESSED with my instant pot too! i got one for xmas and it has been so awesome! I’m so glad my BOYFRIEND will eat pretty much anything, so i’m not limited at all. I love this recipe. I have been a fan of five spice for years, its just so yummy! i use it in my chinese cooking, but never thought to use it in a stew, what a great idea! Is there a special reason to use olive oil to saute the meat? I generally use a neutral like grapeseed so that it wont interfere with the asian flavors. i love this recipe.thank you very much. If you enjoy 5-spice taste, this is a wonderful recipe. I made it in my pressure cooker. While I’m crazy for yellow/orange veggies, and butternut squash (or any other winter squash) would be a delicious sub for sweet potatoes, ordinary white potatoes would be good, too. I haven’t fallen for an instant pot yet, as I think I prefer the control I have with my old pressure cooker–and passed along one I used for a while. 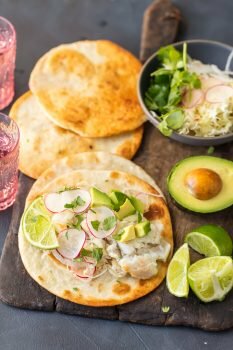 While this recipe takes a fair amount of time and is a perfect use of the instant pot, a lot of instant pot recipes end up taking as long or longer than just using the stove top and a skillet or sauce pan–which are both easier to clean.